We ran into millions of people cheering for the cast of 3 idiots at the Forum Value Mall this evening. The crescendo reached it's peak when Aamir descended to the ground floor via the glass capsule lift. Here's a small clip of the crowds cheering on Sharman, Madhavan and Aamir on the stage. 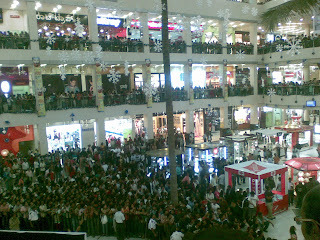 101 million people turned out at the Forum Value Mall Whitefield to catch a glimpse of their favorite star Aamir Khan!